Some stained glass windows are pictorial; they portray the saints or scenes from Bible stories. Others, notably the great rose windows, are abstract; they simply delight us with the beauty of light itself. 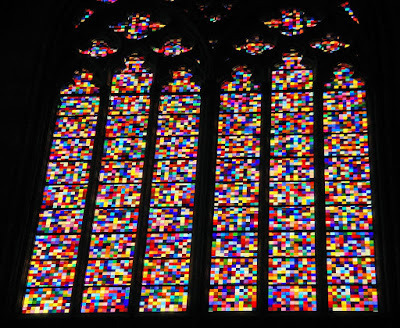 The painter Gerhard Richter created this pixelated stained glass window for the Cologne cathedral. The pattern is modern, but the tradition of presenting light for light's sake is as old as stained glass itself. Click on the image to see a much larger version. You know, if you squint your eyes and stare at the window for a long time, you can see the crowd that condemned Jesus when he was brought before Pilate. At least that is what they say in Koln.